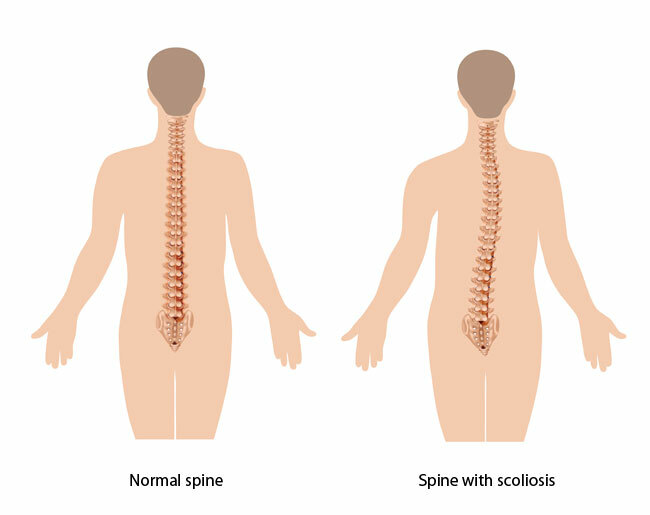 Scheuermann's disease, or juvenile kyphosis or avascular necrosis of the spine is a disease of the spine as a result of which a slow bending of the spine occurs to the back in the lumbar area. In the course of this disease , the death of bone tissue occurs, caused by the impaired blood supply to the particular area of spine. 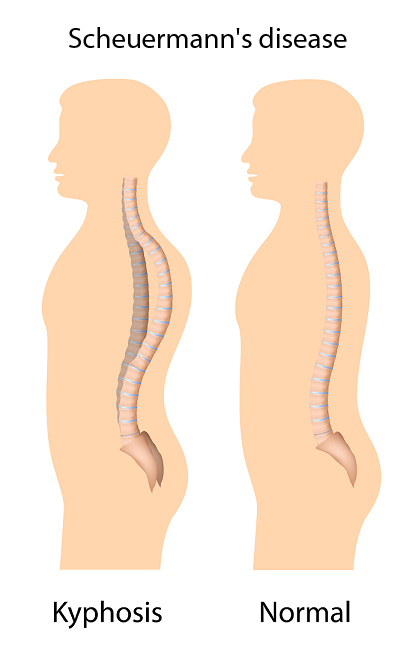 This tissue is regenerated, however, it leads to the deformation of the bones (vertebrae), namely the wedging shape of the vertebral bodies and intervertebral discs, which results in a deformation of the spine in a form of significantly increased kyphosis. It is believed that one of the factors of its occurrence may be genetic. The pain usually occurs as a result of a long-term stay in a seated or standing position, but also during prolonged walking. In a patient with symptoms, the X-ray examination is performed in order to confirm the diagnosis, because the changes developed in the spine area are visible in radiographic images. In very advanced stages of the disease the substantially rounding of the upper back may appear, which can, in turn, exert pressure on the chest and abdomen, and , consequently, on the heart, lungs and stomach. This may cause pain, shortness of breath, and disorders of the digestive system. the lumbar form - occurring least frequently , in the course of which the flat back is also observed. 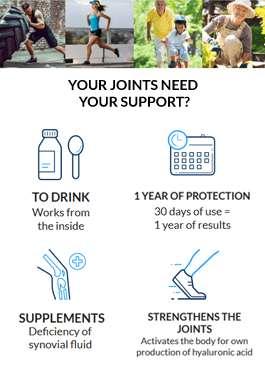 Did you know that the components of Hyalutidin HC Aktiv supplement the synovial fluid in all joints and the neck and lumbar sections of the spine? The spine is actually a base that keeps the bone structure. Remember that prevention is always better than curing. The key to inhibit distortion is an immediate reaction to the first symptoms. Pain ailments in the spine should never be underestimated. The condition is undoubtedly affected by regular exercise, a healthy diet that provides the building blocks of bones and cartilage, and even change in daily habits. In order to determine a safe physical activity, it is best to consult a physiotherapist or rehabilitant, who will choose special exercises, taking into account the physical condition and possibilities of the patient.